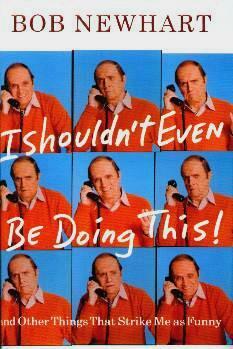 I couldn't wait to read this book as Bob Newhart is one of my all-time favorite comedians. I recall many an aching belly, laughing in front of the television. I was curious to see if his humor translates well to the written page. It does. Mr. Newhart tells of his early career as an accountant back in Chicago, and we're treated to snippets of his comedy routines and how they came about. When I was reading these routines, I could hear Mr. Newhart's voice and see him in my mind. We're also let in to his private life, i.e. his family. All this time I never knew he was a family man with children and grandchildren. I knew he was married for about forty years, but that's all. Not only that, I didn't realize he'd been in so many movies. We're also treated to some hilarious anecdotes about Mr. Newhart's famous friends and colleagues. No malice, just good clean fun and lots of laughter. This is the kind of book you can confidently recommend to any and everyone. I adore Bob Newhart and his quirky characters. Mr. Newhart's shows are available on DVD. Visit his website at www.bobnewhart.com. Conclusion - Very funny and very amusing.